Let me try to explain the title of this post by describing some of my experiences from the past week. Tuesday > Browsing the internet I come across a Moondog CD in someone's photo. I research Moondog because I like the name and sounds a bit like 'Moonpig' the card company. I'm intrigued so I end up on his Myspace page. 'Birds Lament' (1969) plays first which I instantly recognise as the song Mr Scruff remixed in 'Get a move on'. 'Nice' I think to myself (I'm always pleased to find the orginal song a sample has been lifted from), I listened to a few more tracks and then moved on to some other music. Wednesday > There's something bothering me about Moondog. Since hearing his song 'Single Foot' the day before I can't seem to get the sprightly pipe sounds out of my head and they're beginning to drive me a little cuckoo. Fascinated by his story on Wikipedia informing me he was blind, dressed up as a Viking and busked on New York's 6th avenue from the 1940s until 1974, I order a book about him from my local library and head off to visit my friend for the afternoon. During one of our regular chats about music I mention Moondog. She'd never heard of him but was similarly intrigued. Why can't I shake the name? What is it about Moondog that's causing me to obsess? 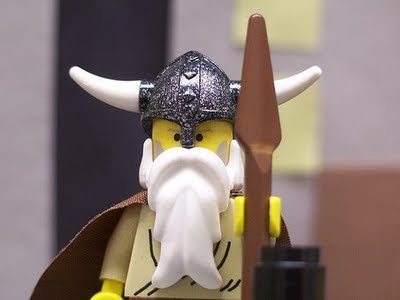 Thursday > I find myself listening to Moondog Radio on LastFM. It takes me on a very surreal Jazzy journey through the likes of Alice Coltrane, John Zorn, Sun City Girls and Raymond Scott. Raymond Scott catches my ear, 'Cindy Electronium' ends sounding uncannily like Kraftwerk. I look up Raymond Scott and discover 'Cindy Electronium' was written in 1959. How could this possibly be? The music sounds electronic and fresh. I digress. (If you're interested, here's a link to a video of Cindy Electronium -Kraftwerk like sounds begin at 1 min 22. ) At this point I feel like I have uncovered a whole new world of music I never knew existed. 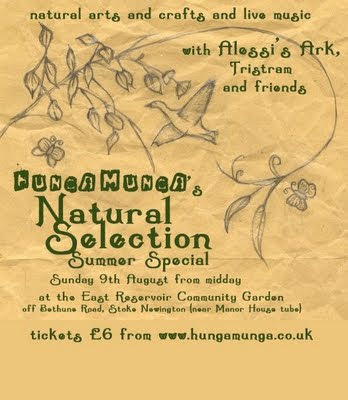 Friday > I see a twitter from Alessi of Alessi's Ark promoting the HungaMunga festival she's going to be playing next Sunday. Sounding like a nice way to spend a Sunday afternoon I headed over to their website and arrived at the booking page. Take a look here (the booking page) to see what greeted me. Moondog loves me! What a coincidence! I book my tickets because I know it'll be a lovely afternoon with live music from not only Alessi's Ark but also Tristam, Brody and Quint, Rebecca Jade, Kari Kleiv, Joe Buzfuz and the fabulous Off Ground Touch. The festival is raising funds for the lovely East Reservoir Community Garden Wildlife Centre, a very worthy cause, you can buy your tickets here, I'm sure Moondog loves you as well! I think you could safely say I've had a Moondog themed week. and Mr Scruff's version sampling Moondog's 'Bird's Lament'. Hey Paul, good to hear from you. The Moondog tribute sounds interesting, can't believe I had never heard of him before last week (even though I had heard his music without knowing it via Mr Scruff). Will be investigating further. Had my first Moondog experience about a month ago when the Guildhall Saxophone Ensemble played a selection of his work at one of the Daylight Union Chapel events. He was somebody I'd read about as being a major influence on so many acts but shamefully not checked out, safe to say I'll be putting him on the list to check spotify and last.fm for asap. Missed that one as well! Bet it sounded great at the Union Chapel, love that place. It seems Moondog lives on even those he's been dead for nearly 10 years come Sept.